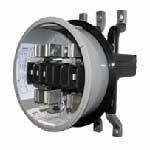 Designed to replace 600 amp K-Base meters to a Form 8S/9S electronic meter without degrading the meter installation. Completely self-contained with very accurate 200:5 Current Transformers with a rating factor of 1.5. Diacs are used to short the CTs when the meter is not in the circuit. Patent No. 7,857,660.